The habanero pepper is one of the hottest varieties of chili peppers. The Scoville unit of measure is directly related to a chemical called capsaicin. The higher the number of Scoville units, the greater the concentration of capsaicin. The habanero pepper measures from 100,000 to 500,000 Scoville units compared with a jalapeno pepper, which measures 5,000 to 15,000 Scoville units. According to Memorial Sloan Kettering Cancer Center, capsaicin can be used as a treatment for a variety of medical disorders. Because of the high concentration of capsaicin, consumption of habanero peppers can promote several health benefits. Scientific studies have shown that consumption of habanero peppers can offer a beneficial effect against prostate cancer. A study performed by the Department of Hematology/Oncology at Cedars Sinai Medical Center in Los Angeles, California, revealed that the oral administration of capsaicin significantly slowed the growth and proliferation of human prostate cancer cells. The results of this study is promising for the use of capsaicin during the management of prostate cancer. It should be noted that this study was performed on laboratory mice; however, the results are encouraging, and research continues on the effects of capsaicin on prostate cancer in the human population. Studies have indicated that the consumption of habanero peppers can be effective at fighting obesity because of the presence of capsaicin. According to the "Journal of Proteome Research," capsaicin increases thermogenesis throughout the body. Thermogenesis is the process in which the body raises its temperature, or energy output. Increasing thermogenesis increases the body's metabolism, which forces fat cells to be used as energy. The study published in the "Journal of Proteome Research" was performed by the Department of Biotechnology at Daegu University in Korea. The study confirms the presence of capsaicin increases thermogenesis and lipid metabolism, which is beneficial for the treatment of obesity. Many scientific studies have been performed to evaluate the effect of capsaicin on serum cholesterol levels. A study performed published in the February 2013 "European Journal of Nutrition" revealed the daily capsaicin and other capsaicinoids in hot peppers help lower cholesterol levels. Researchers fed hamsters a high cholesterol diet and divided them into groups -- those that had no capsacinoids and those that consumed varying amounts. At the end of the 6-week study the results showed that capsacinoids reduced total cholesterol and bad cholesterol levels, without reducing levels of good cholesterol. Researchers also found that capsaicinoids may reduce fatty deposits that have already begun to form in blood vessels and arteries. Cholesterol-reducing benefits were seen no matter what dose the hamsters were given. There is scientific evidence showing that consumption of habanero peppers can be effective at lowering blood pressure because of the presence of capsaicin. A study published in "Bioscience, Biotechnology, and Biochemistry" in June 2009 revealed that the administration of capsaicin raised levels of insulin-like growth factor. Insulin-like growth factor acts to reduce arterial blood pressure. The results of the study state that the presence of capsaicin was effective in lowering arterial blood pressure in hypertensive study subjects. The study also states that there were no blood pressure lowering properties when capsaicin was administered to study subjects with normal blood pressure. 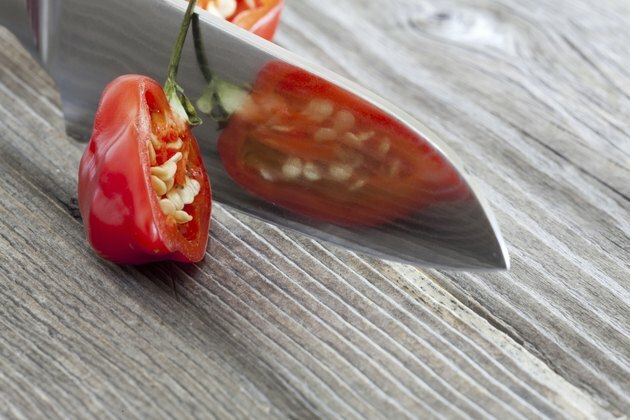 Is Too Much Capsaicin Bad for You?